Want to know where the best deals for Easter eggs are for 2019? You have come to the right place! We will be checking all the best deals on those chocolate treats for Easter to save you money, and we will be updating this page as new deals are launched. 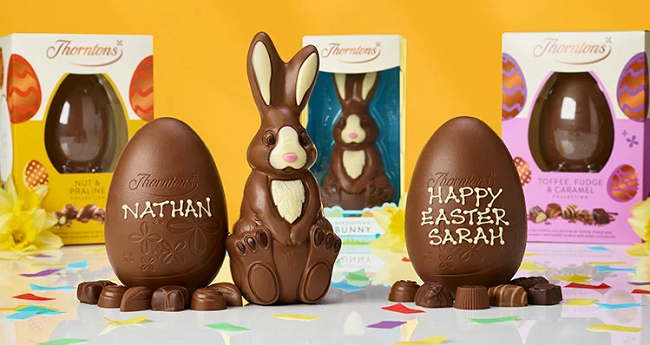 FREE Easter Egg when you spend £25 at Thorntons using code*. Just add £25 or more of Easter treats to your online basket, then enter code EASTER at the checkout and you get this Milk Chocolate Egg 265g* worth £7 for free. Mix & Match Easter offer: £7 each or 2 for £12, 5 for £25 or 7 for £35*. Use the 5 for £25 offer and the code EASTER and you're getting 6 eggs worth £7 each for just £25 - that's just £4.17 per egg. Giant Statement Eggs: £20 or 2 for £30* plus FREE easter egg with code EASTER. Medium Easter Eggs £1 each @ Asda* Includes Cadbury, Maltesers, Kit Kat, Aero, Smarties and more. Selected Large Easter Eggs*(Maltesers, Galaxy, M&Ms, Celebrations, Snickers, Minstrels and Mars) now £2.50 each at Asda. Thorntons Easter Eggs 149g - 162g £2 each @ Asda* RRP £4 each, includes Gruffalo Easter Egg*. Thorntons Easter Egg Multibuy offer @ Thorntons* Selected Easter eggs £7 each, or 2 for £12, 5 for £25 or 7 for £35. Aldi's Easter Six*: Aldi will be launching a new Easter special offer every Friday until Easter. Offers are in store only.